Preheat the oven to 350 degrees Fahrenheit. Prepare a 9-inch round cake pan or a Bundt pan by coating it with cooking spray. If using a round pan, place a circle of parchment paper on the bottom. Break the eggs into a large mixing bowl or double boiler, and add the salt. Set the bowl over a pot of simmering water. Beat the eggs with an electric mixer until they are fluffy and light, 2 to 3 minutes. Pour in the boiling water and beat again immediately until the water is fully incorporated. Add the sugar 1/4 cup at a time, beating thoroughly after each addition. After the final addition, the batter should be thick and pale. Turn off the heat and transfer the bowl to a flat surface. Sift the flour and cocoa powder together in a small bowl. Stir in the walnuts. Beat the vanilla extract into the egg mixture. Gently fold in the flour mixture in three additions with a spatula, working the batter only until it's uniformly moistened. Pour the batter into the prepared pan. Bake the cake for 30 to 40 minutes or until it passes the toothpick test. After removing the cake from the oven, turn it upside down on a rack to cool in the pan. 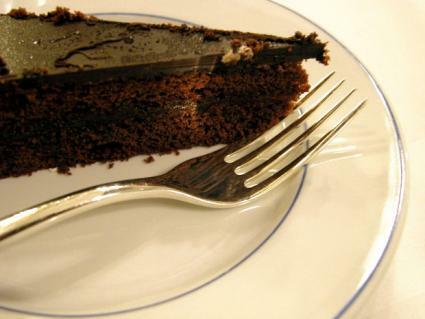 When the cake has reached room temperature, slide a knife around its edge and remove it from the pan before serving.